According to WEEI.com's Rob Bradford, the trade for Chris Sale would not have taken place if the White Sox did not drop their demand for the inclusion of prospect Rafael Devers. Boston balked at giving up the 20-year-old third-base prospect—one of only two 'firewalls' at the hot corner now that Yoan Moncada and Travis Shaw are gone. Devers started slowly in 2016—but came on strong in Single A ball. 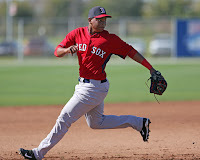 Assuming Pablo Sandoval is in shape (a big assumption) and gets the job in 2017, Boston may look to Devers or their other 3B prospect Bobby Dalbec as soon as the 2018 season.